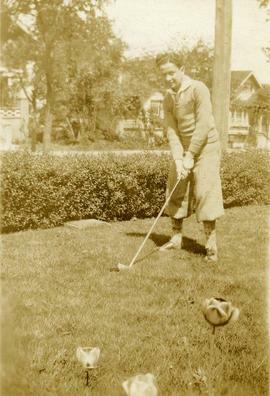 Photograph depicts Nathan Nemetz on a lawn with a golf club. 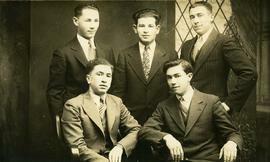 Photograph depicts Ben Dayson, Barney Wosk and three unidentified adolescent boys posing in front of a window. B&W print depicts a young Irving Snider wearing a sailor hat posing beside a tent. This image was likely taken at the "Y" Camp. B&W print depicts a young Irving Snider sitting on a roof posing for the camera. "349 E. Glison St." is written on the bottom of the image.